a beauty, fashion & lifestyle blog. Although the month of September has not yet commenced. I would still like to post my favourites that I've been using day in and day out. The leaves are slowly changing colour and I see the days have become shorter. The mornings have become colder and the leaves are beginning to fall upon the ground. What better than to bring out the jewel tones of beauty and enjoy the more intense scents of spice and cinnamon. If you have ever smelt this body souffle (same thing as a body butter), you will seriously want to eat it. It smells sweet and creamy like a custard dessert. It moisturizes my dry elbows, hands and feet for the colder weather days. These are a STEAL. They go for about $3.99 in Canada and $2.99 in the U.S. They are moisturizing and they smell somewhat fruity. They do have a waxy lip balm taste and scent to them as well. This lip product comes in tinted and non tinted formulas. For what they are worth, they are a great affordable product. They also contain SPF which will protect the skin on your lips from UV rays. These candles smell devine, they smell as good as caramel and fudge. It has a strong sweet caramel aroma. The fragrance is potent and can fill a room with the scent just with the lid off. Add a stronger scent by lighting the candle wick. I found this candle at Walmart and feel in love with it as soon as I smelt it. I went back wanting to buy a backup. But the large size was all sold out. I got mine on sale at $5, regular is about $8. As Autumn approaches I find my way to cinnamon. It's comforting scent and delicious taste. I even add a little pinch of cinnamon into my unscented shampoos or even my handwash at home. It's a great antiseptic as well. I make homemade face masks with it. Here is my recipe: 1 egg white whisked till frothy, add 1 tbsp of raw honey and a 1/4 tsp of cinnamon. Mix all the ingredients together and apply to a clean face with clean hands. Avoid eye and mouth area. Allow the solution to dry and rinse off with lukewarm water. As the weather gets cooler, I like to colour my hair to a warmer shade. I have natural dark brown hair, but I like lighten it just a tad. 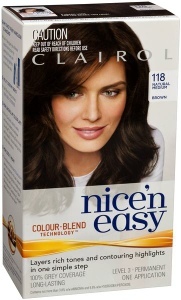 My all time favourite colouring is Nice n Easy 118 Natural Medium Brown.